Officially approved in 1913,the Missouri state flag was designed by Daughters of the American Revolution. The flag features a state seal centered on a field of three horizontal stripes of the French flag's red, white and blue, acknowledging that the land was sold to the U.S. as part of the Louisiana Purchase. The twenty-four stars in both the ring around the state seal design and in the blue sky above the arms show that Missouri was the twenty-fourth state to join the Union. The center of the seal has two grizzly bears representing courage support a shield. 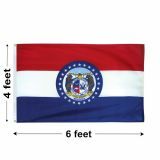 Tuff Flags has a range of Missouri Flags in all popular sizes including 3’x5’,4’x6’,5’x8’,6’x10’and 8’x12’ for all your flag presentation needs. Apart from indoor nylon flags and outdoor polyester flags, we also have indoor flag kits in stock. All our flags are 100% made in USA and come with 6 months guarantee on construction.Shop from our complete line of Missouri Flags right away and avail the best prices, quick shipping and much more! 100% customer satisfaction guaranteed! Celebrate your state pride and love for Missouri with our finely crafted state flags that make symbols of beauty and craftsmanship. Made of premium quality materials and finished with grommets and heading and reinforced with lock stitching, our Missouri Flags are designed to look great and last long. Imprinted with Dupont ink, these UV resistant fabric flags will instantly impress your audience with its elegance. 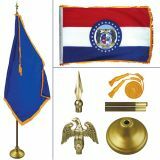 Be it at your home, office or on your table, our flag display will look simply great. Browse our complete line of Missouri Flags and choose a model that suits your needs. Not sure which model is right for you? Call our toll free number (888) 287-3524 or email at customercare@tuffflags.com and we can help you find the best flag model to match your needs.